Have you ever heard of the pollinator’s rule of thumb? The rule says to keep three species of plants blooming each season. Doing so will keep pollinators around your garden, giving them a permanent home. In this article, you’ll learn more about plants that keep giving year round, and how they contribute to attracting the world’s most loved pollinators. Pollinators include bees, moths, beetles, wasps, desert bats, hummingbirds and butterflies. Collectively, pollinators are critical to the function of the ecosystem because they enhance plant reproduction, but where exactly do these tiny creatures love to spend their time? Pollinators love being around edible, native, annual and perennial gardens. These gardens help provide shelter and food sources, and gardens intentionally set up this way they are referred to as “way stations” for pollinators. nourishment a caterpillar needs to transform into an adult butterfly. If a pollinator can visit the same type of flower over and over, it doesn’t have to relearn how to enter the flower and can transfer pollen to the same species, instead of squandering the pollen on unreceptive flowers. Furthermore, planting in groups increases pollination efficiency. We recommend planting a diversity of plants to attract and support a wide variety of pollinators throughout all four seasons. A diversified garden can include flowers of different colors, fragrances and heights. 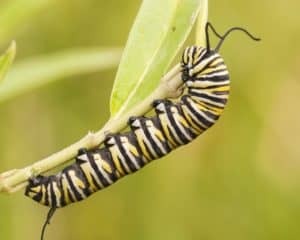 It’s important to note that non-native plants may not provide pollinators with enough nectar or pollen and may not be edible to butterfly and moth caterpillars. Remember that planting a variety of native plants will benefit the local pollinators most. That’s because your local pollinators have evolved alongside these native plants, which are best adapted to the local growing season, climate and soil. Despite their importance, pollinators are threatened worldwide by habitat loss, fragmentation, improper pesticide use, disease and parasites. This has serious economic implications for us as humans and for maintaining the diversity and stability of our ecosystem. You have the opportunity to plant with purpose, playing a vital role in protecting the environment and its creatures by carefully selecting what you plant and choosing how you plant it. We encourage our customers to plant mindfully by planting with purpose. 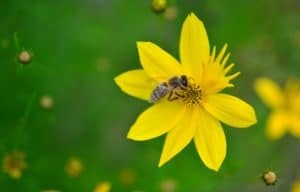 Yellow Coreopsis flowers attract bees that pollinate bright yellow flowers. To learn more about attracting pollinators check out our Resources section or contact us.